After searching around Pintrest for some breakfast ideas I began seeing variations of these cups all over the place. The thing I like about them is that you could do so many variations of them. I chose to use bacon because, well that’s what I had. But you could use ham, Canadian bacon, sausage, or even pancetta. I have to admit, there is something really fun about putting a breakfast all together in a little cup. 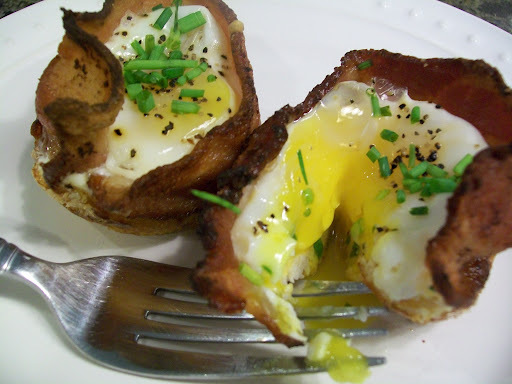 Just like my Denver Omelet in a Cup, and everyone seems to love them. These are very nice because they don’t take any time at all to put together, but you can feed quite a few people. If you have the jumbo muffin pan I would even try doing a double egg one. But even with a regular muffin pan you can make something tasty that is quick, easy, and everyone will like. Remove from oven and run a knife around the edges of each cup to remove them. transfer to plates. Some fresh fruit would be awesome to finish this off (I just didn’t have any).